The Russian Federal Space Agency, Roscosmos, has launched three new crewmembers to the International Space Station aboard the Soyuz MS-05 vehicle. Liftoff was on schedule at 15:41 GMT (11:41 EDT) from the Baikonur Cosmodrome in Kazakhstan with a fast-tracked, four-orbit rendezvous with the Station. The MS-05 crew docked to the ISS at 21:54 GMT. Soyuz MS-05 represents the 134th flight of a crewed Soyuz vehicle and the 60th launch of the Soyuz-FG rocket since it entered service in 2001. Specifically, the mission is utilizing Soyuz spacecraft No. 736. Originally, MS-05 was to use spacecraft No. 735 and launch on 29 May 2017; however, in January, technicians discovered that the original Soyuz for MS-04, No. 734, had a leak in its thermal control system, SOTR. The timeline to fix No. 734 would not allow its use until September, prompting Roscosmos to advance No. 735 to MS-04 and No. 736 to MS-05. However, No. 736’s processing timeline would only allow it to be advanced from its original September readiness date to 28 July. After a tremendous and safe effort, Soyuz No. 736 was carried forward to its new target launch date and mission. 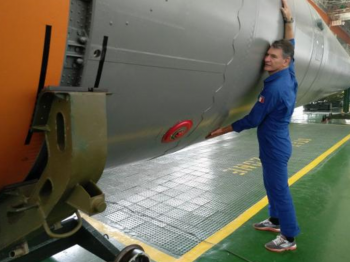 On 4 July, the craft underwent standard vacuum chamber leak testing at Baikonur and passed this test, designed in part to verify its stringent pressurization requirements for flight. On 17 July, the MS-05 crew participated in final training with their Soyuz and the following day performed final fit and leak checks with their launch and entry suits. The next day, Soyuz MS-05 was filled with its onboard propellants and compressed gases before technicians transferred it to the Spacecraft Assembly and Testing Facility, where they installed Soyuz onto a jig for additional pre-launch processing – including mating the craft to the adaptor that allow it to attach to its Soyuz FG carrier rocket’s third stage. By 21 July, the designer’s inspection was completed and clearance given for the craft to proceed to payload fairing encapsulation. On 24 July, the crew performed one final inspection of Soyuz, this time in its launch configuration, before the encapsulated craft was transported to the Launch Vehicle Integration and Test Facility. The following day, Soyuz MS-05 was mated to the Soyuz FG rocket’s third stage, and the combined MS-05/third stage was then mated to the second stage of the rocket – completing rocket integration activities and clearing the way for the rocket to be rolled to the pad. On 26 July, the integrated Soyuz FG rocket was transported to pad No. 1/5 at Baikonur – the same pad used by Yuri Gagarin in the first human spaceflight 56 years ago. With all going to plan with fueling, crew ingress, weather, and the vehicle, the MS-05 mission lifted off from Baikonur at 15:41:12 GMT. Per a nominal ascent, Soyuz MS-05 was inserted into orbit 8 minutes 45 seconds following liftoff, after which the vehicle passed over a communications and data tracking ground station in Eastern Russia at the Vostochny Cosmodrome. Here, initial orbital parameters were determined so controllers at Mission Control Moscow could provide formal permission for Soyuz MS-05 to perform a fast track rendezvous with the Station. Had the orbital parameters read by Vostochny not aligned with those needed for a fast track rendezvous or if Vostochny was unable to verify certain parameters, Soyuz MS-05 would have instead implemented a 2-day orbital rendezvous – which is always available as a backup option. Under the preferred quick rendezvous plan, Soyuz MS-05 performed four Delta Velocity (DV) burns to change its overall velocity by 53.362 m/s and properly refine its orbit toward the Station. 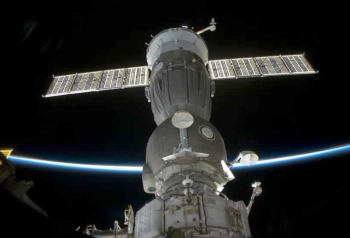 Soyuz then started its automated rendezvous sequence with the ISS at 19:55 GMT. 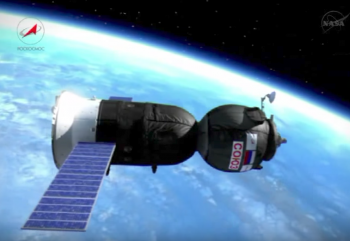 Docking of Soyuz MS-05 to the MRM-1 module of the Station was set for 22:00 GMT (18:00 EDT; 00:00 CEST on 29 July) – though this can vary by several minutes. Actual docking time was noted as early, with contact and capture at 21:54 GMT. Pressurization of the vestibule between the two spacecraft then occurred, followed by hatch opening at 23:57 GMT (19:57 EDT, 01:57 CEST on 29 July) – at which time the Station’s three new crewmembers moved into their new home. Soyuz MS-05 was commanded by Roscosmos’ Sergey Ryazanskiy, with NASA’s Randy Bresnik and ESA’s Paolo Nespoli serving as Flight Engineers. Following tradition, the crew has officially given their capsule the call sign Borei, or Boreas, after the Greek god of the cold north wind and the bringer of winter. Sergey Ryazanskiy is a biochemist and veteran cosmonaut and Flight Engineer for the International Space Station. Born 13 November 1974 in Moscow, Ryazanskiy graduated from Moscow State University in 1996 with a degree in Biochemistry before working as a researcher at the Institute of Biomedical Problems. 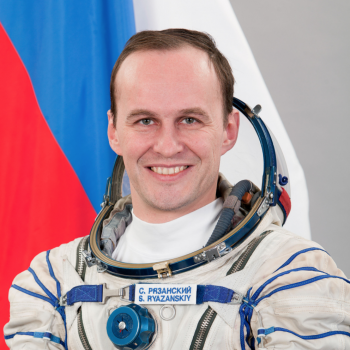 Selected by Roscosmos as a research and test cosmonaut in 2003, he completed training two years later and worked technical assignments for Roscosmos before being assigned to the 105 day phase two part of the Mars 500 program in 2009. Following Mars 500, Ryazanskiy was assigned as a backup crewmember to Soyuz TMA-08M and then as a member of the prime crew for Soyuz TMA-10M and as a Flight Engineer for Expeditions 37 and 38. Ryazanskiy launched on his first mission on Soyuz TMA-10M on 25 September 2013 and subsequently took his place as a member of the Expedition 37 crew. During the course of Expeditions 37 and 38, Ryazanskiy performed three EVAs, or spacewalks – the first of which marked a first for the International Space Station when Ryazanskiy took the Olympic torch for the 2014 Winter Olympic Games in Russia outside the ISS. 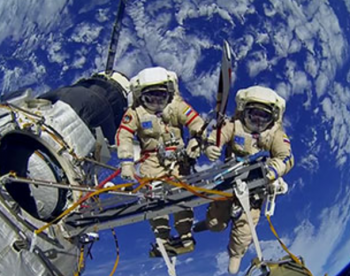 During his second spacewalk, he helped set a record that still stands: longest Russian EVA at 8 hours 7 minutes. 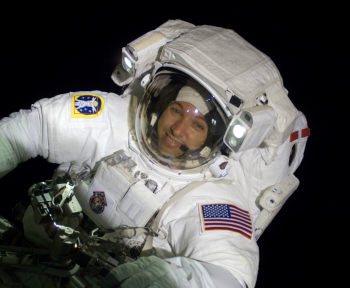 Cumulatively, his three spacewalks earned him an EVA time of 20 hours 5 minutes. Ryazanskiy completed his first tour of duty aboard the ISS on 11 March 2014 when Soyuz TMA-10M landed in Kazakhstan, bringing Ryazanskiy’s total time in space to 166 days 6 hours 27 minutes. He was subsequently assigned as backup to Soyuz MS-04 while simultaneously training for his main role as commander of Soyuz MS-05. When MS-05 arrives at the Station, Ryazanskiy will serve as Flight Engineer for Expeditions 52 and 53. Randolph James “Komrade” Bresnik, born 11 September 1967 in Fort Knox, Kentucky, is a veteran NASA astronaut who will make his first long-duration mission on Soyuz MS-05. A Fighter Pilot and Colonel in the US Marine Corps, Bresnik earned a Bachelor’s degree in Mathematics from The Citadel in 1989 and received his commission as a Second Lieutenant in the Marine Corps at the same time. He then attended The Basic School and Infantry Officers Course before being designated a Naval Aviator after completion of advanced flight training in 1992. Bresnik then served as a member of the Navy Fighter/Attack Training Squadron VFA-106, during which he received initial F/A-18 training before serving in the Marine Fighter/Attack Squadron, VMFA-212, and attending the Marine Corps Weapons and Tactics Instructors Course and Naval fighter Weapons School – TOPGUN. Bresnik was then accepted into the U.S. Naval Test Pilot School, after which he became a Fixed-Wing and Systems Flight Instructor before moving back to the Naval Strike Aircraft Test Squadron as a Platform/Project Coordinator for flight testing on the F/A-18 A-F.
At the same time, Bresnik earned a Master of Science degree in Aviation Systems from the University of Tennessee-Knoxville in 2002 before reporting to Marine Aircraft Group 11 as the Future Operations Officer. 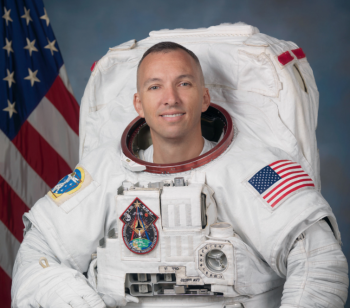 In January 2003 he deployed to Kuwait, and while deployed applied to NASA for selection in Astronaut class 19 – to which he was accepted as a Shuttle pilot candidate astronaut. After completing Astronaut Candidate Training in February 2006, Bresnik performed technical duties in the astronaut office before being assigned as a Mission Specialist, not a pilot, to the STS-129 mission in September 2008. As STS-129’s launch slipped to November 2009, Bresnik and his wife discovered they were expecting their first child… with a due date in mid-November. 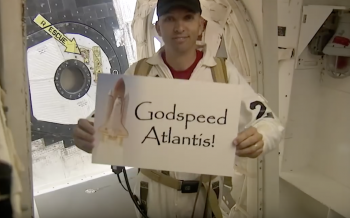 On 16 November 2009, Bresnik launched on his first spaceflight aboard the Shuttle Atlantis for a logistics mission to the Station. On 22 November, NASA informed Bresnik that his wife had given birth to their daughter, Abigail Mae Bresnik, overnight. Bresnik became the first astronaut to become a parent for the first time while in space and the second astronaut to celebrate the birth of a child while on orbit. 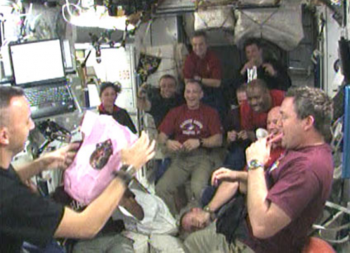 Mike Fincke, already a father to one, became the first astronaut to have a child born while on orbit when his wife gave birth to their second child in June 2004 halfway through his six-month Expedition 9 mission. During STS-129, Bresnik participated in two of the mission’s three EVAs and logged 10 days 19 hours 16 minutes in space. For the duration of the Shuttle Program, Bresnik served as a support astronaut on the closeout crew – responsible for final Orbiter configuration for launch and strapping astronauts into their seats – and was the closeout crew’s Lead Astronaut for the STS-135 finale with the Space Shuttle Atlantis on 8 June 2011. After the end of Shuttle, Bresnik served as the Lead Astronaut for NASA with SpaceX in their design and development of the crew Dragon capsule. 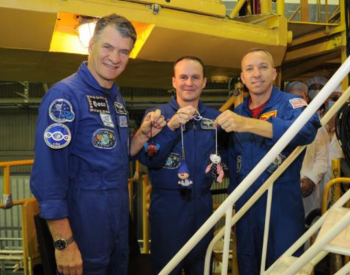 Bresnik also served as Commander of the NEEMO 19 mission from 7-13 September 2014. Soyuz MS-05 will mark his second trip to space and his first long-duration mission – where Bresnik will first serve as Flight Engineer for the remainder of Expedition 52 before serving as Commander of the ISS for Expedition 53. 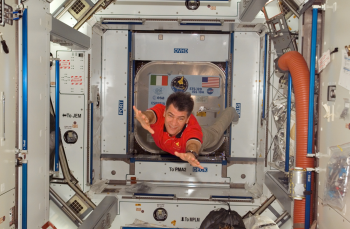 Paolo Angelo Nespoli is a veteran European Space Agency (ESA) astronaut for the Space Shuttle and ISS programs. 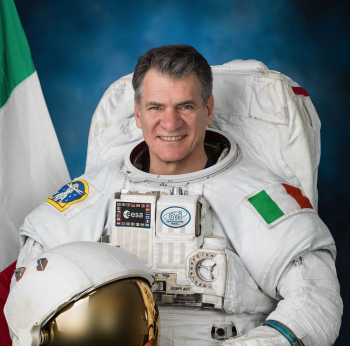 Born on 6 April 1957 in Milan, Italy, Nespoli was drafted into the Italian army in 1977, serving as a non-commissioned officer and parachute instructor. In 1980, he became a Special Forces operator and later served in the Multinational Peacekeeping Force in Beirut, Lebanon, before he was appointed an officer while continuing to work as a Special Forces operator. Nespoli began university-level study in 1985, left active military service in 1987, and earned a Bachelor of Science in Aerospace Engineering in 1988 and a Master of Science in Aeronautics and Astronautics in 1989 from the Polytechnic University of New York. He then worked as a design engineer for Proel Tecnologie and conducted mechanical analysis and support qualifications of the Electron Gun Assembly (EGA) flight units, a main part of the Tethered Satellite System. 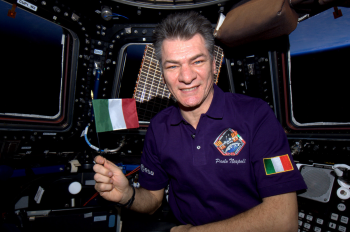 During his time working on the EGA, Nespoli also earned a degree in mechanical engineering from the Università degli Studi di Firenze in Italy. In 1991, Nespoli accepted a job at ESA’s European Astronaut Centre as an astronaut training engineer and in 1995 worked on the EuroMir project at ESA’s European Space Research and Technology Centre and was responsible for the team that prepared, integrated, and supported the Payload and Crew Support Computer on the Russian space station Mir. The following year, Nespoli transferred to the Johnson Space Center (JSC) and worked in the Spaceflight Training Division, training crew for the ISS. In July 1998, he was selected as an astronaut by the Italian space agency and joined ESA’s European Astronaut Corps, reporting to JSC as part of NASA astronaut class 17 to begin Astronaut Candidate training – which he completed in 2000 with a qualification to serve on Space Shuttle missions and expeditions to the Station. In August 2004, he was assigned to the Gagarin Cosmonaut Training Centre in Star City, Russia, where he completed initial training on the Soyuz spacecraft. In June 2006, Nespoli was assigned to the STS-120 mission – a Shuttle flight to deliver the Italian-built Node-2 Harmony module to the ISS. Nespoli launched on his first mission on 23 October 2007 aboard the Shuttle Discovery and participated in the delivery of Node-2 Harmony, supported the mission’s planned and unplanned spacewalks, supported the relocation of the P6 solar array truss, and supported the repair and continued deployment of a tearing solar array on the P6 truss. The mission also saw Nespoli work with then-ISS Commander Peggy Whitson and perform several experiments for the Esperia mission for ESA. Nespoli logged 15 days 2 hours and 24 minutes in space during STS-120, and he was then assigned to the Expedition 26/27 mission to the Station. Launching on 15 December 2010 on Soyuz TMA-20, Nespoli arrived at the Station two days later and took up his role as a Flight Engineer for Expedition 26. During his stay on the ISS, Nespoli was responsible for docking operations of ESA’s second Automated Transfer Vehicle (ATV-2, Johannes Kepler) and was also the prime robotics operator of the Space Station Remote Manipulator System (SSRMS or Station Arm) during berthing of the second Japan HTV-2 vehicle. Nespoli also conducted experiments from human research, fluid physics, radiation, biology, and technology demonstrations and was also responsible for filming most of the content for the documentary First Orbit for the upcoming 50th anniversary of the first human spaceflight. Finally, Nespoli was present for two of the final three Space Shuttle missions to the Station, helping oversee installation of the final module of the US segment of the Station – the Leonardo module delivered by Discovery on the STS-133 mission. 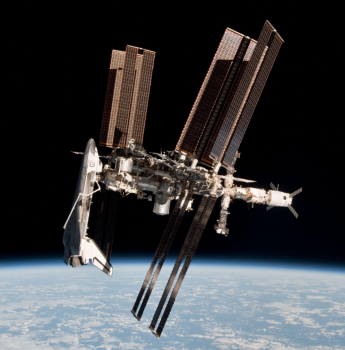 He was also present when Endeavour arrived for STS-134 – a mission that, with the installation of Endeavour’s OBSS (Orbiter Boom Sensor System), marked US assembly complete for the Station. While Nespoli would see Endeavour arrive, he would not see her depart. Instead, he was tasked with a special and single-opportunity assignment: Photograph and video Endeavour docked to the ISS while he and his Soyuz TMA-20 crewmembers undocked from Station and left the orbital outpost for entry and landing. The photos, the only of their kind of a Shuttle Orbiter docked to the International Space Station as seen from close orbital proximity, provided numerous engineering and awe-inspiring snapshots of the vehicle that built the Station docked to its orbital creation. With the completion of Expedition 27, Nespoli’s total time in space reached 174 days 9 hours 40 minutes. 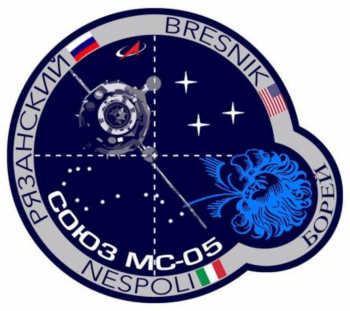 Now assigned to Expeditions 52/53, Nespoli will rejoin Peggy Whitson on the Station when he arrives later today.